​Russ Grazier, Jr. is a Co-Founder of the Portsmouth Music & Arts Center (PMAC) and its Executive Director. 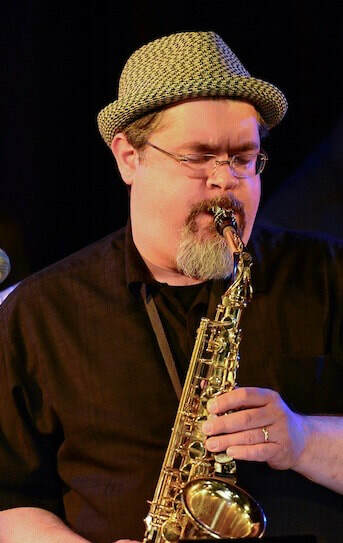 A native of Portsmouth, New Hampshire, Russ is a composer and saxophonist who has taught saxophone, composition, and music theory for over 25 years. He earned his Bachelor of Music degree in Composition with Saxophone Concentration at Boston Conservatory and a Master’s degree in Composition at Peabody Conservatory. Additionally, he studied graduate-level composition at the University of Chicago. He has taught at some of the most prestigious music schools in the country, including Boston Conservatory, Roosevelt University (Chicago), the University of Chicago College, the New England Conservatory Preparatory School, and the Merit School of Music (Chicago). Russ has been composer in residence with Chicago’s CUBE Ensemble, and his music has been performed by the Contemporary Chamber Players of Chicago, the West End String Quartet, CUBE, Voices from the Heart, and many other ensembles and soloists. In 2011, he won the Duo Fujin one-day composition competition and his winning work, analecta for flute and saxophone, was performed by the duo on their tour of the Southeast U.S. in Spring 2012. He is past president of Art-Speak, the cultural commission for Portsmouth, where he lives with his wife, Katie, and their two sons, Max and Jake.